On Jingle Bells overload? Ready to pull out your hair if you have to make one more trip to the mall? Finding peace and quiet during the crazy holiday season can be tricky! I work full time at home and part time at the mall. I actually used to work full time at the mall too, but gave that up this year. Plus I’m a single mom, so I’m solely responsible for making sure my son has the best Christmas ever. Every. Single. Year. Talk about pressure! 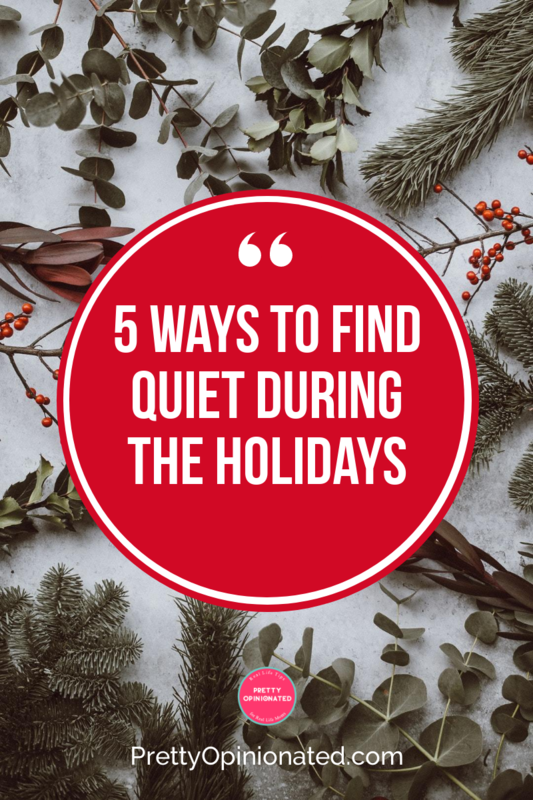 How do you find a bit of peace and quiet for myself during the holiday season? Check out my tips! Please note, they’re kind of tongue-in-cheek and meant to be fun, although they actually do work! As a review blogger, 90% of my life revolves around work, even if it doesn’t really. If I want to read a book in peace, I just tell anyone who may bug me that I’m reviewing it. A night out at the movies? Maybe I’ll review that too! Obviously, not everyone is a blogger. My other job is taking photos of kids with Santa at the mall. How can I use that? I can always download a photo app on my phone, hide in my room and say I need to check out the latest toys so I can be prepared when kids talk about them. It’s not lying if you actually do it. Also, to be totally honest, I’m not above white lies to protect my sanity. Go holiday shopping…far, far away. Skip your local mall, gas up the car and take a trip down the highway to a mall a good hour away. Why? Because you get a whole two hours (round trip) of peace and quiet. Go in one store, grab something you need, then sit in your car and order the rest online! Yes, I know, it costs gas money, but sometimes it’s worth it to get away. My son wants absolutely nothing to do with the cheesy romantic, totally formulaic holiday love stories that run round the clock on a certain cable channel. I personally love them. When I turn them on, he bolts upstairs with the Roku to watch something else. Quiet time for me, quiet time for him. Win-win for both of us. Want to know my surefire trick for getting my son to run far, far away from me these days? Singing. While he loves my lullaby singing at bedtime, he despises my annoying singing during the day. He doesn’t like my “Today is Friday, No School Tomorrow” song. He tells me to sing it in my head, otherwise he’s just going to start going to school on Saturdays. So when I need him to vamoose, I sing badly. In all honestly, my kid is pretty awesome at entertaining himself, so most of this post is just for fun. I adore Jacob and kind of wish he’d let me spend MORE time with him. He’s growing up so fast and tends to gravitate more towards his friends than his silly Mama these days. How do you find peace during the holidays? Which flavor of Nescafe with Coffee-Mate do you think you would like best? I think I would like the Vanilla flavor the best. We use French Vanilla here thank you for asking it is my favorite. I think I’d like the French Vanilla the best. I would like to try hazelnut. That is one of my favorite parts of my morning coffee. Is the quiet. The silence. Just me, my thoughts, and my mug. One of the best parts of the day. Hazelnut would be my favorite. I find peace any time by snuggling in bed with a good book or putting in my headphones and watching my favorite shows. I usually sneak away while hubby and my daughter are watching TV. I’ve tried Nescafe’s new product and both my daughter and I loved it. We have yet to try the Original flavor. My parents were visiting us for a few days and he liked it too. I love snuggling up with a good book too. I’m taking vacation this week and plan to do a lot of reading!